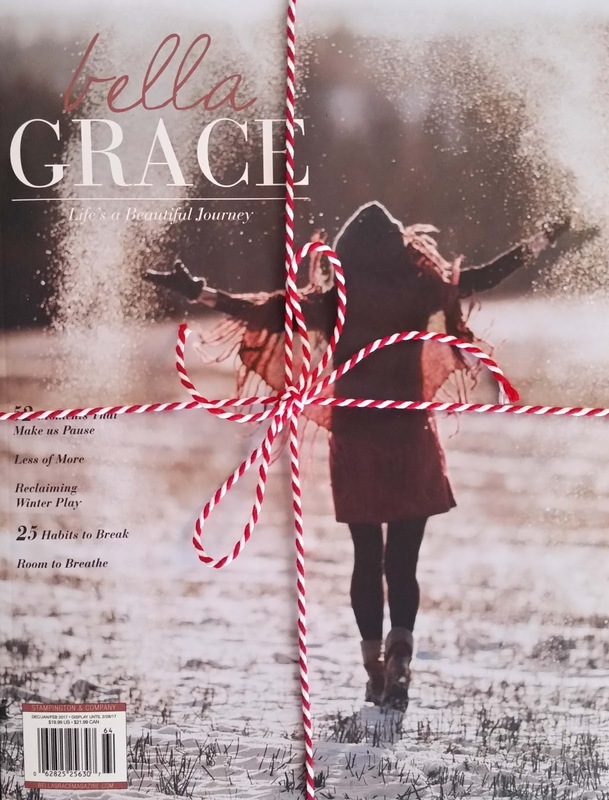 The winter issue of Bella Grace hits newsstands today, and it features an article by yours truly! 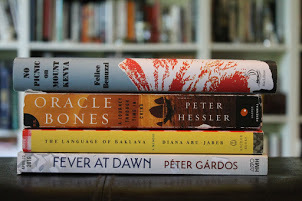 Because I am so very happy about my work being in this great magazine, and because it’s the season of spreading around joy, I am giving away one issue of Bella Grace. All you gotta do is leave a comment about how you spread around joy! Please do so by end of day Sunday so that I can mail it on Monday, and you will maybe receive it in time for Christmas (or Chanukah), and in any case, in time for the time between the years when Bella Grace is the perfect magazine with which to while away a few hours. Speaking of spreading around joy, I spent last Sunday afternoon packing packages to mail to loved ones for Christmas and Chanukah. I worked at my desk in the sun porch while it snowed steadily outside, and my husband kept a fire crackling in the adjacent living room. 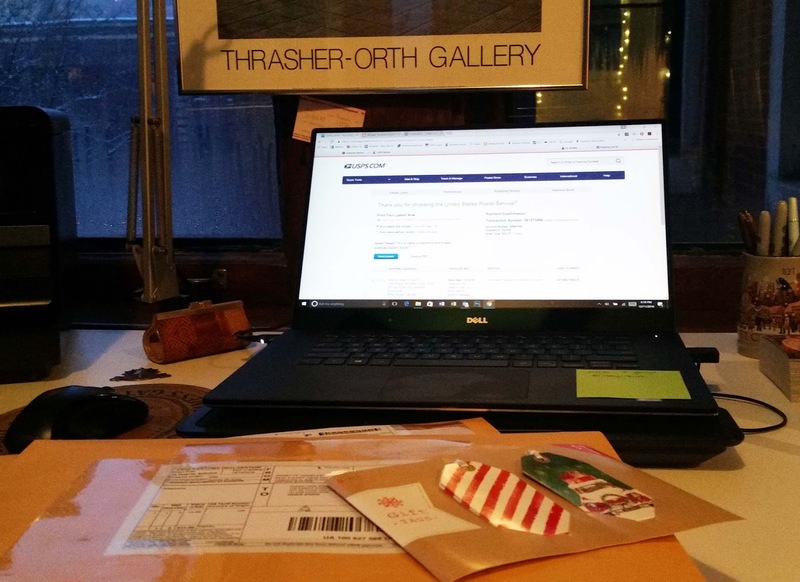 I filled out shipping labels online, wrote little notes with holiday greetings, wrapped presents, and assembled each package. It was a picture-perfect, getting-ready-for-the-holidays day. I think mailing something tangible off to loved ones who are far away is critically important. It just packs so much more love than an email or a text. Mainly, probably, because it takes more effort. I even spent some time putting together a Chanukah garland to send to my son in Israel. I could only send him something that could easily fit into a flat envelope because, serving in the IDF, he is rarely home and so I cannot send him a decent package. I can only send him something flat that fits into his mailbox (I could send something larger in care of a friend where he would have to pick it up but he has so little free time that I don’t want to cause extra hassle). So, a flat envelope it must be! Even if he thinks the garland is silly, the point is that he will have “something to unwrap” as my grandmother used to say. While I am not very good at sending packages during the holidays, I just packed up and sent a child's rocking chair built by my great-grandfather to my niece in France for her small children. I hope it will bring joy to the whole family this season! Love your blog, Annette. I think he definitely appreciates the garland! I always hope that my music volunteer work brings joy and peace. I play the piano for church and our local care home. I have a lot of mixed feelings about the holidays. This year I'm sending out a card that literally says JOY. Does that count?? Although this is a tad late for the Christmas holiday, I was gifted your site this evening and wanted to share with you a drop of my shared joy. I am a photographer and every December I send out my homemade holiday cards. I've been doing this for at least a decade now and they have become somewhat of a tradition, as many say it isn't Christmas until they open their mailbox and find my card. It is quite humbling, I must say. Alycia, thanks for sharing! It sounds like you started a wonderful Christmas tradition with your homemade cards.